Folders have two pockets that are die-cut for a business card and diskette. Double-dip design offers a different-colored interior than the exterior. 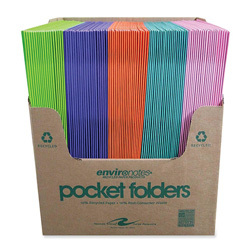 Each folder is made of heavy-duty stock. Assorted Colors Portfolio and Report Covers from Roaring Spring Paper! 1 In Stock today.